This attractive new single storey building lies just 100 metres from the sandy beach of Frangokastello. 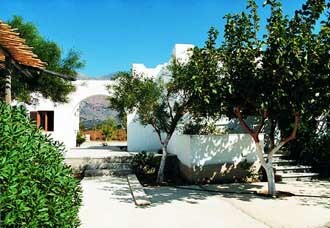 The Dolphin apartments are built in a large garden of 5000 sqm, which is nicely planted with flowers and young trees. The friendly owners run a small shop next door to the apartments, selling basic provisions, so you certainly don’t have to go far for some of your shopping. There are 8 apartments, about 60 sqm each, which accommodate 4-5 people. They have two bedrooms, one with twin beds and one with double bed, a living/dining room with a kitchenette, shower/wc and a terrace overlooking the sea. Close by is a choice of tavernas specialising in Greek dishes.